321Soft Video Converter for Mac is versatile video format conversion software which can convert video files including AVI, MPEG, WMV, MP4, M4V, F4V, RM, RMVB, FLV, SWF, MXF, MOV, MKV, 3GP, VOB, especially HD video format (AVCHD, MTS, M2TS, HD MKV, HD WMV, HD TOD, MOD, HD MOV, HD FLV, HD TS, HD MPG, HD TRP, on your Mac for fitting various multimedia devices like iPad, iPod, iPhone, PSP, MP4 Players, etc And it also enables you to convert video and audio files to mainstream audio such as MP3, M4A, AAC, AC3, WMA, WAV, RA, MP2, OGG, etc. Moreover, the integrated software offers the best way to create vivid video from pictures or capture pictures in batches for enjoying with family. swiftly and perfectly on your Mac OS X. Using the Mac video converter, you can convert video to video, audio to audio or extract audio from video files. settings (either simple ones or advanced ones) at will, such as to set the destination, the name of the output files etc. The software provides a simple, easy and fast conversion for you! Easily convert between almost all video and audio formats on Mac OS X. Convert videos for use with hardware digital players and any software. Extract audio from video files or convert between audio files. Convert HD video for your mobile devices, or convert for uploading to YouTube. Optimized presets to fit iPhone, iPad, iPod, HTC, Nintendo Wii, Walkman, iMovie, YouTube, etc. Super fast conversion speed, No limitation for highest speed, conversion speed will be improved with better performance of your Mac. Almost all popular video and audio formats are supported like AVI, MPEG, MP4, AAC, M4A etc. You can pause, stop the Mac video converting at any time you like in the conversion process. You can either use the default settings or set the parameters by yourself. You can preview the files to be converted. Clip video to get beloved segments and remove unwanted parts. Merge many video files into a whole to convert. Support Xbox video, including HD video. It provides editing function for ID3 tag of WMA/MP3 format. 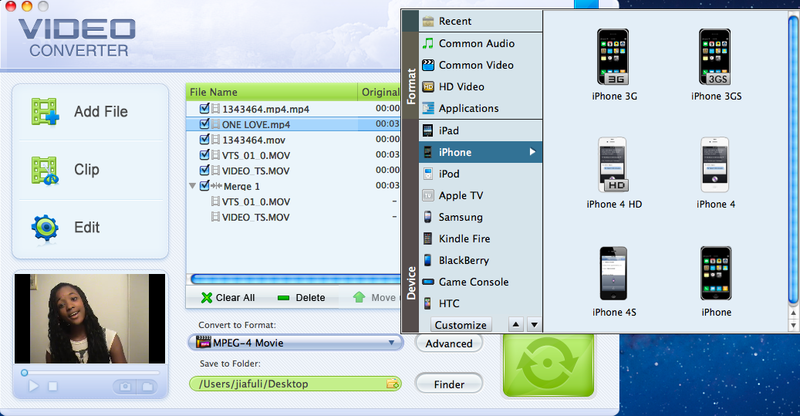 convert from one popular video format to another, save videos and DVDs to your iPod. A HD Converter to convert HD TS/MTS/MPEG/WMV. Converts HD videos to HD AVI/AVC/MPEG4 TS/MPEG2 TS/WMV. Converts video and audio formats, and rips dvd to video on Mac. Grab Movavi's 2D to 3D Video Converter and turn 2D to striking 3D without breaking the bank.